← SWEET REVENGE gets 4 1/2 Stars and Top Pick from RT Book Reviews! 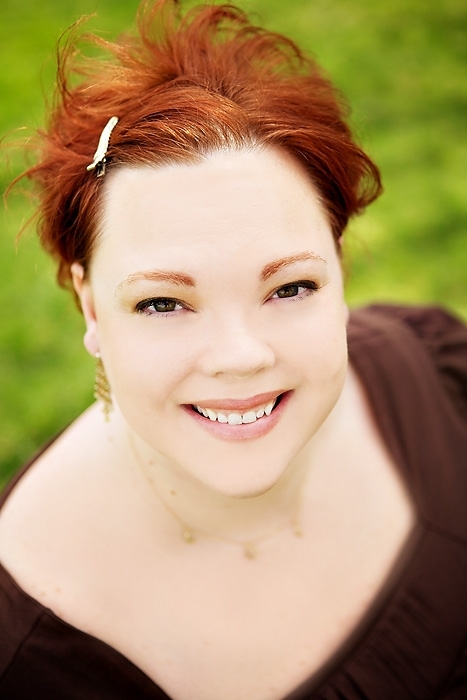 Guest post and giveaway with author Heather Snow! 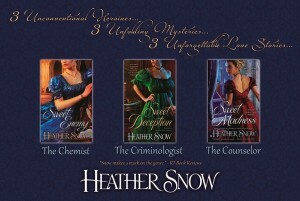 I’m thrilled to have as my guest today romance author Heather Snow! Take it away, Heather! A little about me for those who don’t know me: I’m a sleep-deprived mother of two young boys, known affectionately on social media as The Heir and The Spare. I’m an avid reader…or at least I was before deadlines and diaper duty. Now I’m more of an avid listener—God bless audiobooks! I’m a cat person who somehow just got tricked into agreeing to get a dog this summer (rotten husband…and he said it in front of the boys, who are now over the moon. I would be an evil mommy to say no now…)—oh, and I write historical romance with heroines who put the blue in bluestocking, the men who love them and the mysteries they have to solve. Oh, and my latest novel starts in a sanatorium for the insane. “What?”, you say. “Don’t you write regency romance?? ?”, you ask. “Shouldn’t you be putting your characters in a ballroom and make them be witty?” Well, yes…and there are a couple of ballroom scenes, I promise. 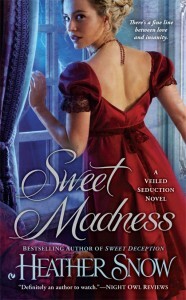 But from the moment the story of SWEET MADNESS gripped me, it wouldn’t let me go. And so I wrote it. 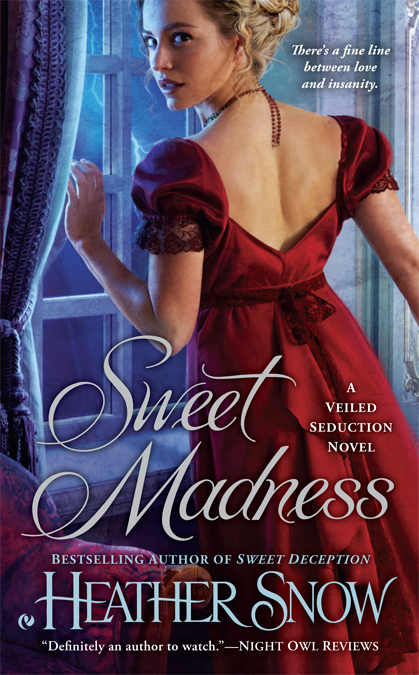 SWEET MADNESS is the story of strong man brought low, a traumatized soldier now facing the terrifying prospect of losing his mind. But Gabriel is a fighter…hope burns eternal in his heart and he’s willing to do what it takes to get well. Luckily for him, our heroine, Penelope, knows what it takes and is willing to fight by his side. I did a lot of research about how “lunatics” were perceived and treated at the time, most of which couldn’t go into the book… It is a romance, after all, and as I’m sure you can imagine, the mentally ill were not dealt with in the most humane and compassionate manner in those days. But I thought I might share a little about it here with you today. Particularly about lunacy hearings. A family member or concerned citizen would swear out an affidavit to the Lord Chancellor via the Master extraordinary. Once an affidavit was sworn, a petition would be made and a public commission appointed to determine the individual’s sanity—a writ de lunicato inquirendo. And when I say public, I mean very public…a spectacle very often held in a local tavern (so that anyone who wanted to attend could.) People from far and wide came to gawk, particularly if the accused lunatic was a member of the noble classes. The hearings and testimony were also printed up as entertainment in the newspapers. Nearly two hundred such cases were featured in the London Times alone between 1820-1860, and about a dozen of them were considered the top news of their day, depending on how salacious the hearing was, how depraved the testimony, or how well known the lunatic. One of the most sordid was the 1823 hearing of the 3rd Earl of Portsmouth, which shocked the reading public with claims of abuse, adultery, threesomes, and which resulted in the earl’s marriage being set aside and his wife’s children being declared bastards. Thank you so much for having me here today! While I’m here, I’d love to do a giveaway. One winner will get their choice of the first two books in the series, SWEET ENEMY or SWEET DECEPTION (which recently won the Gayle Wilson Award of Excellence for published historical romance!). Just answer a question for me: Nobility were sort of like the celebrities of their day, and we all know how the public likes nothing more than watching a celebrity meltdown…just ask the National Enquirer, TMZ and the slew of reality television shows! What do you think it is about us that makes us so fascinated? 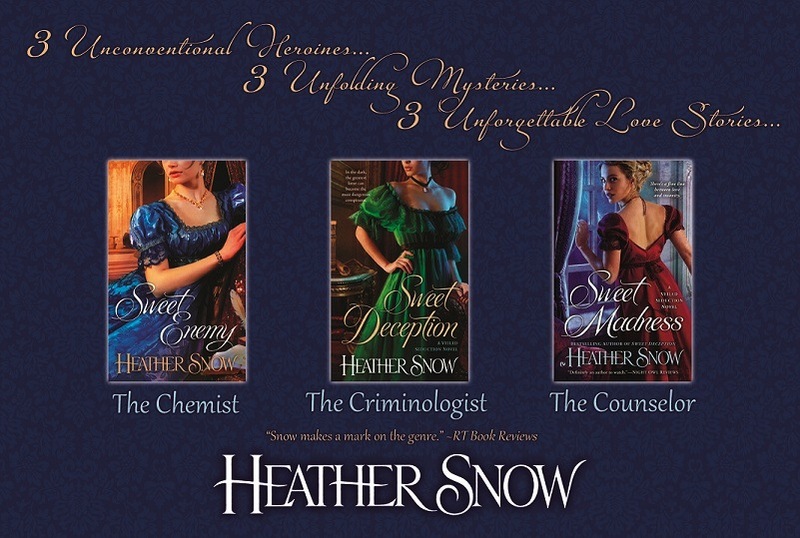 Heather Snow is an award winning historical romance author with a degree in Chemistry who discovered she preferred creating chemistry on the page rather than in the lab. She lives in the Midwest with her husband, two rambunctious boys and one very put upon cat. Mr. Snow has promised the boys a dog this summer. The cat is not happy. This entry was posted in Uncategorized by Zoe. Bookmark the permalink. It was great seeing two of my favorite authors together .